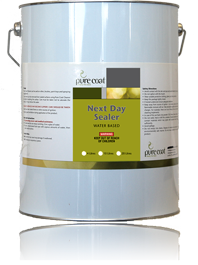 pure coat Next Day Sealer is a water based sealer with a semi-wet look finish much like the pure coat Semi-Gloss. The ease of application makes pure coat Next Day Sealer perfect for a DIY project creating a water resistant barrier, protecting your surfaces for a long and hard wearing beautiful appearance. A coverage rate of approximately 8m2 per litre on a smooth surface, however the porosity and texture of the surface and method of application may vary the coverage rate.